A portrait of Brian Friel, renowned playwright and author who now lives in Greencastle, was unveiled last Friday in the National Gallery of Ireland by Mary Hanafin, T.D., Minister for Tourism, Culture and Sport. The portrait, by Mick O’Dea RHA, was commissioned in 2009 by the Gallery’s Board of Governors and Guardians on the occasion of the playwright’s 80th birthday as part of the contemporary portrait series. 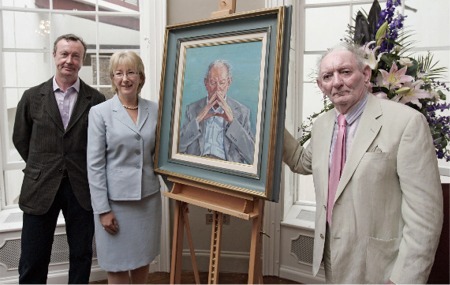 Congratulating artist Mick O’Dea for his portraiture, Minister Mary Hanafin said: “Mick O’Dea has produced a thoughtful and sensitive portrait of Brian Friel, who is one of Ireland’s most prominent playwrights, theatre directors and authors. “Brian has made an enormous contribution to the cultural life of the nation and his influence on current and the new generation of Irish writers is profound. Friel was born in Omagh, County Tyrone. In 1962, he published his first collection, The Saucer of Larks, and saw his first major theatrical work The Enemy Within produced to critical acclaim. This paved the way for Philadelphia Here I Come!, which was staged as part of the Dublin Theatre Festival in 1964 and firmly established Friel’s reputation. He was a founder member in 1980 of Field Day, the theatre company that staged his new play Translations. That work and his more recent Dancing at Lughnasa (1990) have become classics of Irish theatre. Friel has penned more than twenty plays in total, including adaptations of work by such writers as Turgenev and Chekhov, demonstrating consistently both formal innovation and an extraordinary skill in the writing of dialogue.